I Rx’d the deadlift weight with 55kg. Scaled the toes to bar to knee raises. There was a 12 minute time cap and I finished 6 deadlifts of the 5th round. I wanted to go lighter on the deadlifts, but Vincent said I should do Rx.. I knew I was going to be too slow… but in the end I’m kind of glad he told me to go heavy.. It’s what I used to do in Marbella.. go for weights over speed. I’ve not been doing that in Lelystad even though I prefer it. I liked the workout. I was so shaky afterwards from moving all that weight. But in a good way :). I didn’t do any extra work as I had to rush to dinner. I have signed up for a marathon with 3 of my colleagues. We are going to run the whole distance in estafette, which means each of us will run approximately 10km. The marathon is on April 10th, so still have some training time luckily :). My running is really bad at the moment. I struggle running 5km, let alone 10. So definitely time to start practicing it more. 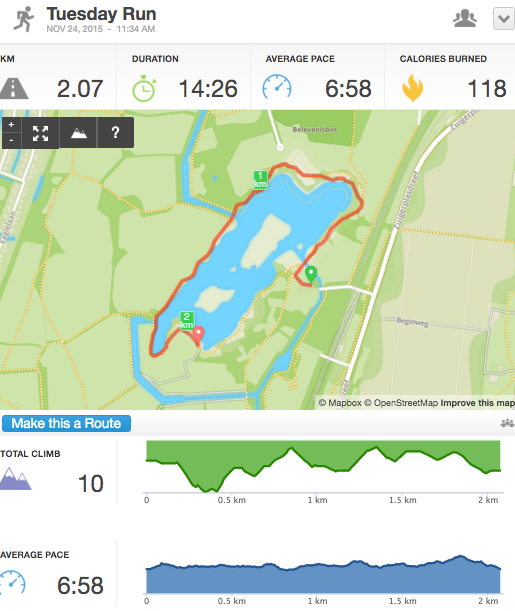 Yesterday I went for a run in het Zuigerplasbos. It was raining and storming like crazy, but I went anyway. I was so cold!! So weird to be sweating, but have freezing hands at the same time. Anyway.. I didn’t go very fast or far, but it’s a start :). After 30kg I wanted to stay at that weight, since my technique is still so wobbly, but Vincent made me go up. First at 35kg was horrible, cause I got under the bar so slowly that I had to push the bar out like a press. Second one went much better. I liked this workout.. I did the snatches with 25kg and the ring dips with a blue band. I managed to finish 9 snatches in the round of 12’s. Double unders went well. Snatches are slowly starting to get better. Still a loooong way to go though. I did 3 x 6 banded push ups. The band kept moving and it was hard! The band pull downs were ok.. it started burning after about 30 so started doing quick sets of 10 from then on. I didn’t look at the time, but don’t think I took much longer than 2 minutes. Both push ups and pull down were with a red band. The overhead sit ups I did with 2 8kg kettlebells. Basically you lay down and raise the kb’s to the sky and lockout your arms and then you start doing sit ups. Interesting exercise.